My fridge and pantry are filled with wholesome veggies just waiting to be put to use in the perfect recipe! I love potatoes! Russets, Yukons, Butters, Reds, Fingerlings...but lately I've tried to avoid them a bit to aid in getting the rest of my "baby fat" off! So I've been eating a lot more sweet potatoes, which suits me just fine! I came up with this soup last week! The texture is velvety smooth and is the perfect balance between savory and sweet! The flavors are uncompromisingly pure because you are using very few ingredients! I think you'll love it just like I do! In a large saucepan, put olive oil and sliced leek over medium heat to get tender. About 5 minutes. Add cubed sweet potatoes and chicken stock. Raise heat to high and boil for 20 minutes until sweet potatoes are tender. Put the cooked sweet potatoes and leeks along with the cooking stock in a blender and blend until smooth. Pour back into the sauce pan and over medium heat, add the milk to get to your desired consistency. 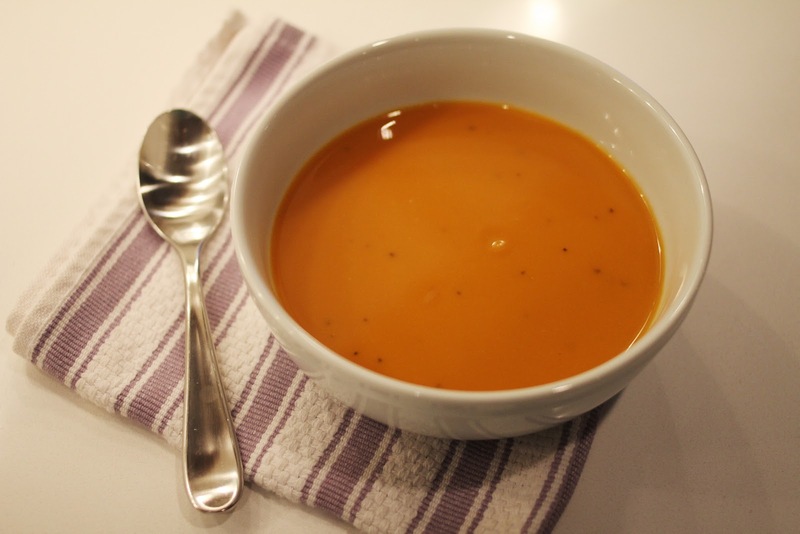 Allow the soup to heat through and then add S&P to your tastes! Thanks for letting me share another healthy recipe with you! :) Makes 4 generous servings!